Same sponsor, different continent …. after a five-year hiatus Trailfinders are back and this time they’ve transported us to South Africa. For eight consecutive years Trailfinders brought us Australian themed gardens, bidding a temporary farewell in 2013 with an epic garden designed by the brilliant Phillip Johnson, one of my garden design heroes. That garden won a gold medal and the coveted Best in Show award. In the intervening years Trailfinders and their partners Fleming’s Nurseries were missed, not only for their gardens but their antipodean informality and sense of humour. The partnership always brought something fresh to Chelsea, occasionally getting up the noses of established British designers, which is never a bad thing. Having taken a break, Trailfinders have backed both a new continent and new designer, Jonathan Snow. His design presents us with a careful and beautifully articulated study of a South African wine estate. So much can go wrong with this style of show garden. There’s the risk of cramming far too much in, or ending up with a garden that looks like it belongs at Legoland. Buildings, in particular, are tricky as they generally have to be scaled down and occupy a lot of space. Trying to recreate any foreign landscape on British soil is a challenge, let alone three different ones. Whilst I wanted this garden to be great, I had my doubts. It turns out that I should have had more faith. Everything about the delivery of this garden is quite brilliant. 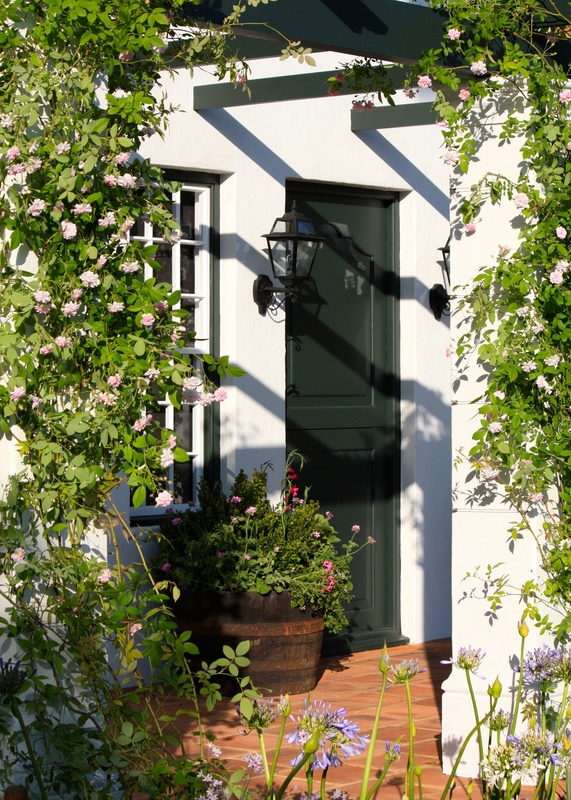 The proportions are superb, allowing the facade of the Cape Dutch homestead to look perfectly at home in its setting. A white verandah, paved with terracotta tiles, is swathed in pale pink roses, R. ‘Paul’s Himalayan Musk’ to be precise. Of course there had to be agapanthus, one of the signature flowers of South Africa, but then comes a small, formal garden edged with box and billowing with cottage garden plants. Mixed in are cultivated forms of Fynbos* plants such as Aristea major, Dierama pulcherrimum, Tulbaghia violacea and Libertia grandiflora. 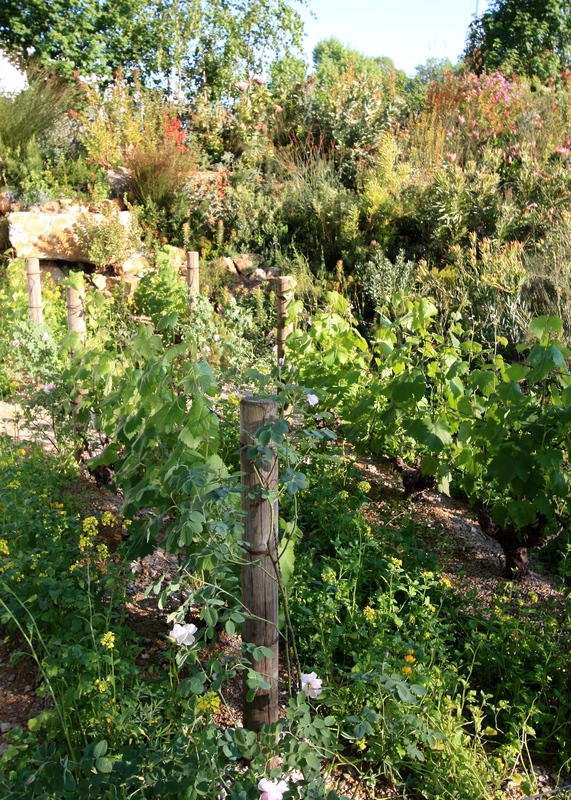 Such gardens are typical of South African wine estates, providing a soothing contrast to the harsh Fynbos landscapes beyond. A gate in a whitewashed wall leads into a small vineyard. If anything, this section might have been made slightly larger as it quickly gives way to Fynbos. In common with wine growing areas the world over, roses are planted at the end of each row of vines. This allows early detection of diseases which might harm the vines, since roses tend to succumb to problems first. In between the vines, wild flowers have been sown to attract insects. These would ultimately be ploughed back into the soil as a green manure. This kind of sustainability is essential in a finely balanced habitat which is already threatened by alien species and over-fertilisation. 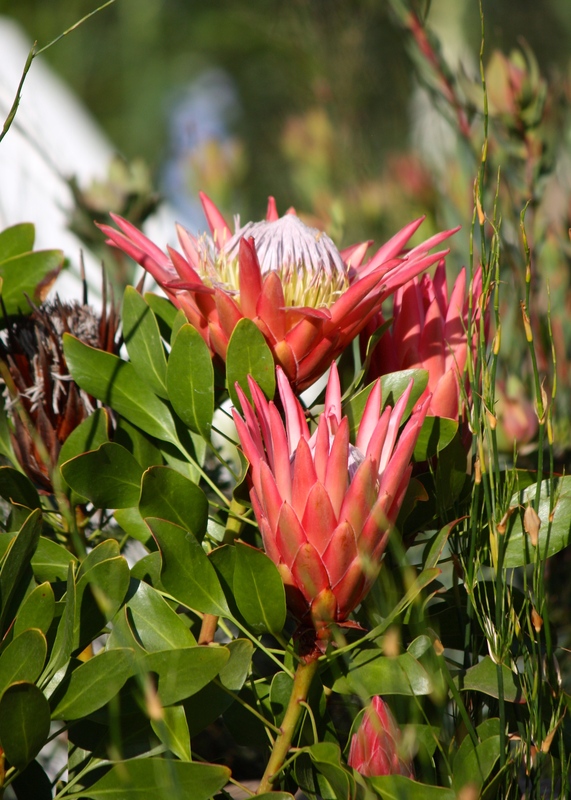 Most fynbos plants are adapted to nutrient-poor soils and are particularly susceptible to the presence of a high level of phosphates, which leads to chlorosis (yellowing) and then necrosis (blackening). 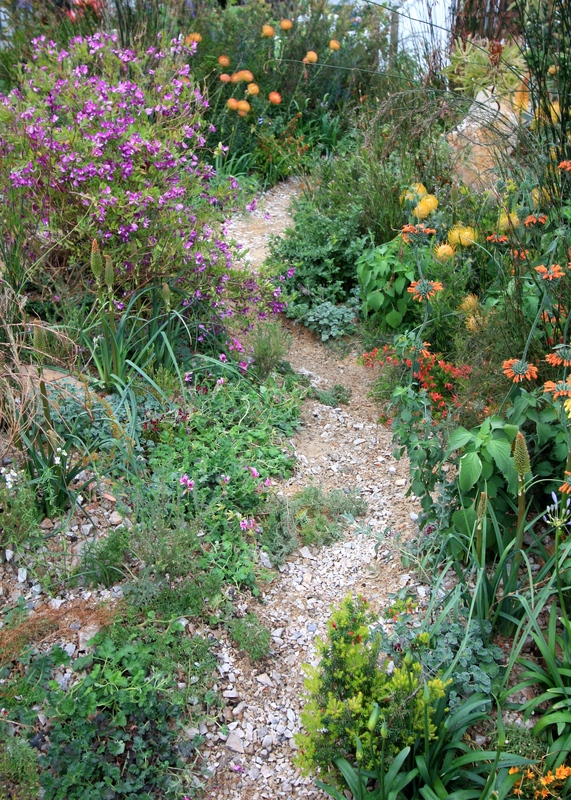 As we enter the show garden’s Fynbos the plot has been banked up sharply to the right, representing an area that would be considered too steep to be cultivated. Here we find a rich mix of plants, representing the world’s smallest but most botanically diverse floristic kingdom. There are leucadendrons, proteas, kniphofias, serrurias and leucospermums, a whole gamut of plants we recognised from florists and exhibits in the Great Pavilion. Most are not hardy here apart from in the mildest parts of the UK, and not entirely happy outside except in Western Cornwall and the Scilly Isles. Plants for the garden were sourced from Cornwall, Tuscany and Southern Spain. 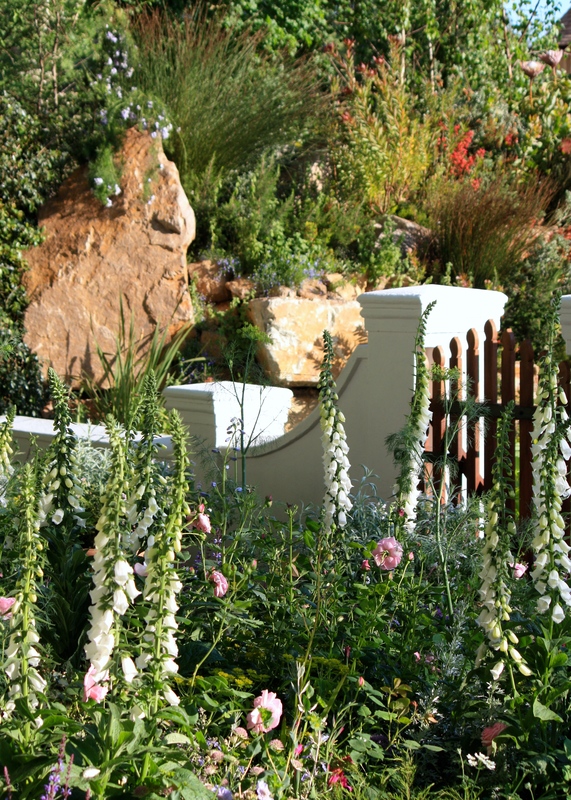 10,000 seeds purchased from Kirstenbosch were germinated and grown on into plants of show garden standard by experts at Kellways, a prominent name in British Horticulture since 1851. Some visitors to Chelsea may be puzzled by the charred remains of shrubs at the front left-hand corner of the garden. These represent fire, which is an essential part of the Fynbos life-cycle. Fire clears old growth, returns precious nutrients to the soil, and enables certain seeds to germinate, through the effects of heat and smoke. The ground here is peppered with flowering bulbs such as ixia and ornithogalum, taking advantage of the space and light to do their thing before larger shrubs regenerate from the base or from seed. It’s a cycle that has similarities to heathland here in the UK, or to coppice woodland, only without the element of fire. Where there’s an opportunity to grow, there’s always a plant to take it. I know that I am not alone in enjoying this garden. 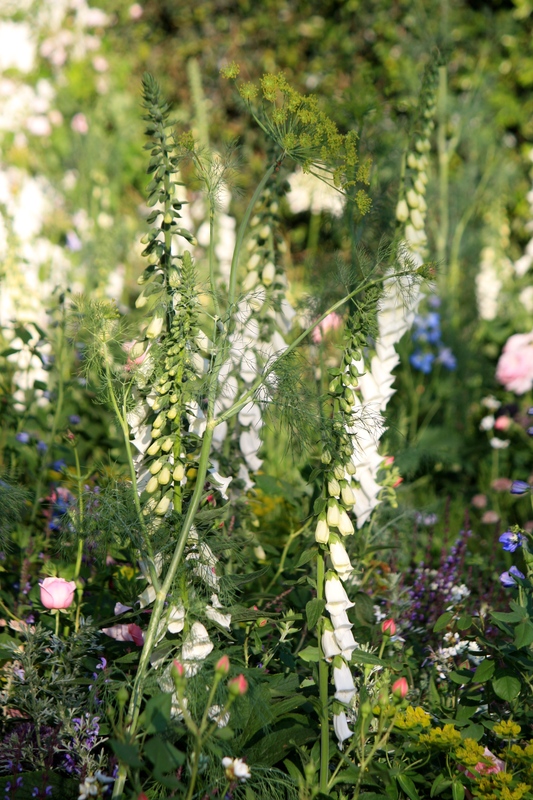 It brings to a Chelsea the relatable and the exotic, formality and wild nature. It’s an exciting a heady mix, presented by a deft hand. Jonathan Snow’s design makes the plot appear considerably larger than it is, and views from the front of the plot to the homestead at the back are carefully contrived. No criticisms readily come to mind, so I shall not search for them – I even liked the simple post-and-wire fencing that surrounded the plot, which I thought was charmingly understated. Trailfinders, Jonathan Snow and contractor Mark Richardson of Stewart Landscape Construction should be well pleased with their silver-gilt medal. What prevented the judges from awarding gold is anyone’s guess, but for what it’s worth I was charmed by the whole composition. Well done chaps – please don’t leave it another five years before you come back and transport us to sunnier climes again. TFG. Continue scrolling down for an extensive plant list and more photographs. *Fynbos is a small belt of natural shrubland or heathland vegetation located in the Western Cape and Eastern Cape provinces of South Africa. I too loved this garden and was left scratching my head at the Silver-Gilt. Hopefully they will give it another go soon, I can’t wait to see what else this pairing comes up with. Oh Dan, such a different garden from the normal Chelsea line up. Although not my taste (probably too close to home in style for me…) it was beautifully conceived. I appreciate that many of the plants are so difficult to grow in the UK so it must have been so interesting so see some unfamiliar plants, So glad there were some aggies! What an exercise to grow all those seeds and have them ‘right’ in time for the show. I have no idea how the judging works but my goodness there are some beautiful gardens that I would have thought deserved better than the medals awarded. I love this garden, and it is good to see the planting in detail. Especially the vineyard section, which got lost in the tv footage. I liked this one from the beginning: such vibrant colours and even the ‘burnt bit’ is interesting. A lot of these plants will grow here, of course, and that’s probably what I should be aiming for instead of trying attain the unattainable! I should be very happy to be in a position to replicate this garden Jane. How us gardeners enjoy making life difficult for ourselves! We like a challenge don’t we? Kirstenbosch was awarded gold and I must say I’m wondering why this exhibit did not get gold – from a personal point of view, I prefer this one. Either way South Africa was well represented. Whilst I liked the Kirstenbosch stand I did think it was quite similar to previous years. The Trailfinders Garden was something new. Well if the judges are trying to defy logic or to deter exhibitors this is the way. Hope Trail Finders find your blog Dan and read that we the British public love and value their garden and hope that they return to us next year with another treasure. I agree it would be great to see them back. A Silver Gilt medal is not to be sniffed at! Thank you for always putting out a fabulous blog. Your coverage of Chelsea this year is fantastic, I love the images. 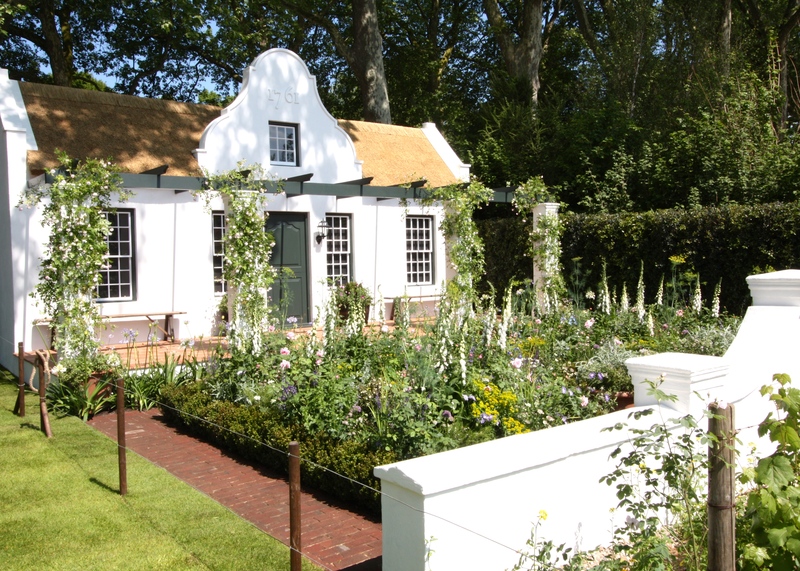 I must however say that as a South African that follows your blog from these beautifully sunny shores; I will agree with you and your readers that it is a beautifully constructed garden, however I find Jonathan Snows garden incredibly patronizing. This country has such an incredible wealth and diversity of culture as well as a profusion of floral diversity, and it seems all that the British can do is harp on about the Cape Dutch style and the Winelands ( a holiday that probably 90% of South Africans ) can’t afford to take. So for a company like Trailfinders to stand behind a garden design that quite honestly will remind most South Africans about the horrors of Apartheid, and the people that Governed them in those early years is disappointing. If he truly wanted to represent this country he should have dug deeper into the roots of South African culture ( excuse the pun ), and his garden would have been far more vibrant and exciting, and most importantly culturally appropriate. 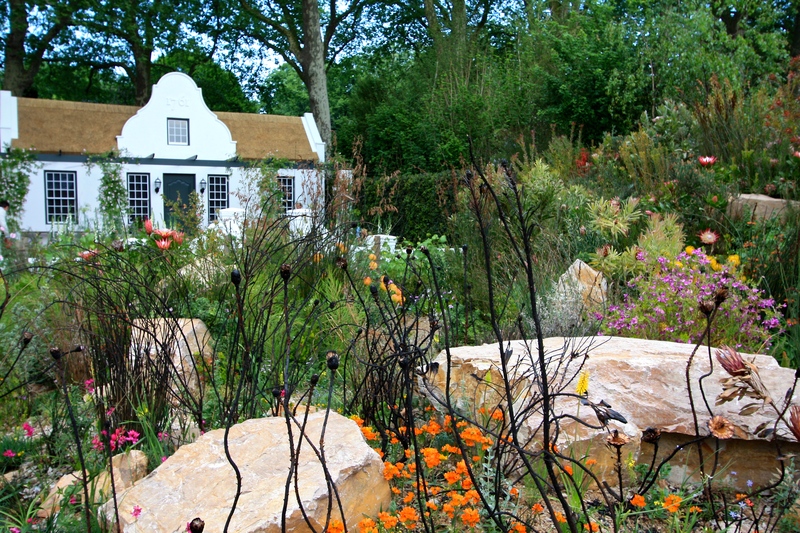 I’m sure most people on here will disagree with me, but maybe one day we will have a show garden on main avenue at Chelsea, representing the True South Africa, actually designed by a South African designer, however at the £ to Rand exchange rate I don’t believe that will ever happen. That said, thank you for a fabulous blog, I do love reading about your adventures, and it always takes me back to my years spent in the UK. Have a fabulous Chelsea week. Hi Joao. Always good to get a different perspective so thank you for commenting. I can understand your point. I suspect most UK based visitors are simply judging the garden by its attractiveness rather than any underlying message. And of course Trailfinders are drumming up trade for their holidays so the designer probably had a clear brief. 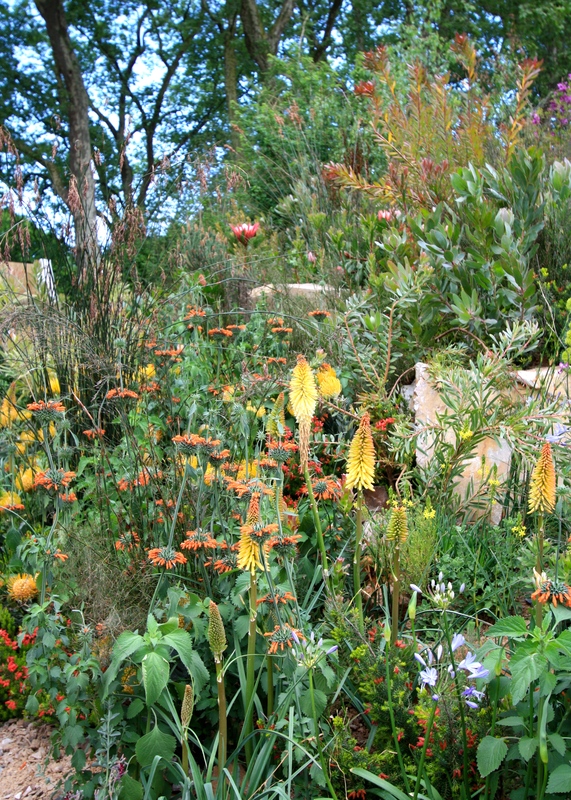 Although neither South African by design or designer, the Sentebale garden from 2015 does offer a different perspective on the region: https://frustratedgardener.com/2015/05/22/chelsea-flower-show-2015-stars-of-the-show-sentebale-hope-in-vulnerability/. Really enjoying reading your Chelsea Flower show reviews. Seeing photographs of the gardens, rather than only brief glimpses on the TV, allow time to weigh them up. The planting lists are really helpful too. Thank you! I’m pleased you find the planting lists useful Girl Friday. They are a bit of a chore to copy out, but otherwise they can only be found on leaflets which I tend to throw away eventually. This way they are saved for posterity. The only proviso is that the leaflets are often printed before the garden is built and occasionally plants are substituted at the last minute. Thanks again, for taking the time to type them up. Love these lovely romantic gardens! I am sure it can’t be easy being an RHS show garden judge. The responsibility must weigh heavily when the hopes and dreams of the designers, sponsors and all who worked on creating it rely on your judgement. In the end I believe public recognition counts for increasingly more, as evidenced by the popular ‘People’s Choice’ award which went to the Yorkshire garden.